Joe drew a right-angled triangle on an A6 file card. He asked Penny to cut it out and then cut it in two to make two right-angled triangles. Then he asked her to cut each triangle in two to make four right-angled triangles in total. Now Joe’s triangle was very special. Penny found that the lengths of all the sides of all the triangles were a whole number of millimetres. What was the area of the smallest triangle? I can’t believe how long I messed around with this before seeing how obvious easy it is. When you cut a right triangle into two smaller right triangles (by cutting along the perpendicular to the hypotenuse that goes through the right vertex), both new triangles are similar to the first. The two congruent triangles make a rectangle of size a by d, where a<d. 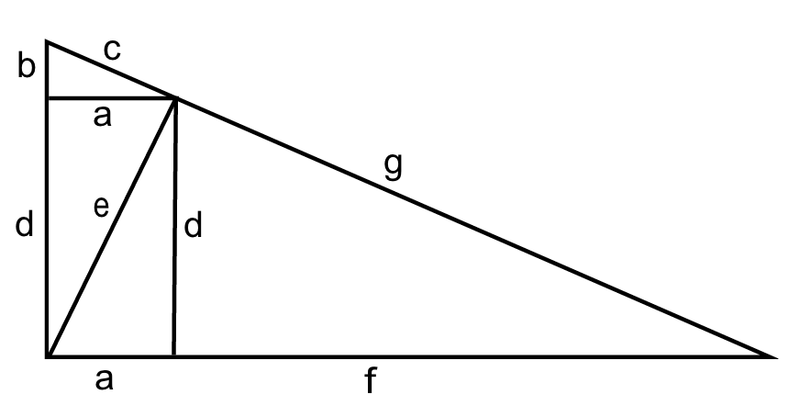 Adjacent to the short side is the smallest triangle, a:b:c. Then the two triangles d:a:e are larger by the ratio a/b, and the largest triangle f:d:g is larger than that by another factor of a/b. From this we get d = a (a/b), e = c (a/b), f = a(a/b)2, and g = c(a/b)2. Now if a:b:c are a Pythagorean triple then (multiplying by b2) so are ab2:b3:cb2 and db2:ab2:eb2 = a2b:ab2:cab and fb2:db2:gb2 = a3:a2b:ca2. The lengths of the sides of the original triangle are b3+db2 = b3+a2b and ab2+fb2 = ab2+a3, and the hypotenuse is cb2 + gb2 = cb2 + ca2 = c3. If a:b:c is the smallest Pythagorean triple, 4:3:5 (recall a>b), the sides are 75 and 100 and the hypotenuse is 125. An A6 card is 105 mm by 148 mm, so this triangle fits. The next smallest Pythagorean triple (that is, next smallest value of c) is 8:6:10 which gives a hypotenuse of 1000 mm, much too large. So there is only one solution, and the smallest triangle has area ab5/2 = 486 square mm.